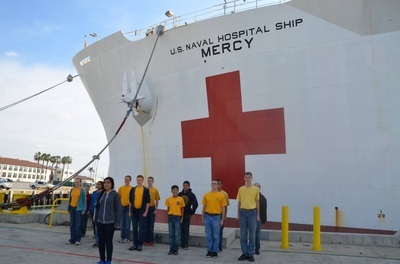 Cadets learned how the USNS Mercy provides rapid, flexible, and mobile acute medical and surgical services to support Marine Corps Air/Ground Task Forces deployed ashore, Army and Air Force units deployed ashore, and naval amphibious task forces and battle forces afloat. 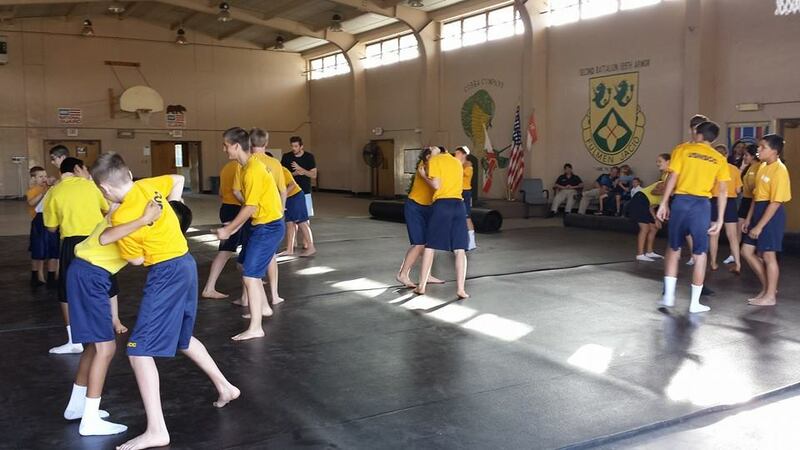 Cadets learned basic hand-to-hand grappling moves for self-defense from a black-belt instructor in jiu jitsu. 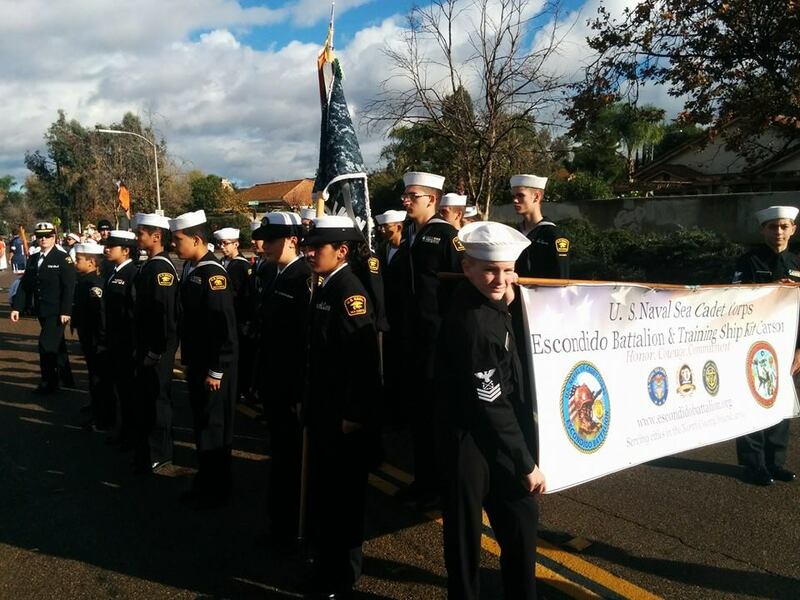 Escondido Battalion/TS Kit Carson participated in the Escondido Jaycees Annual Christmas Parade, marching down Broadway from Escondido High School to Grape Day Park. EBN/KIT was awarded the first place trophy for unarmed military drill. A visit from an F-18 pilot followed by a trip to Kearny Mesa High School to practice on flight simulators gave cadets a glimpse into Naval aviation. 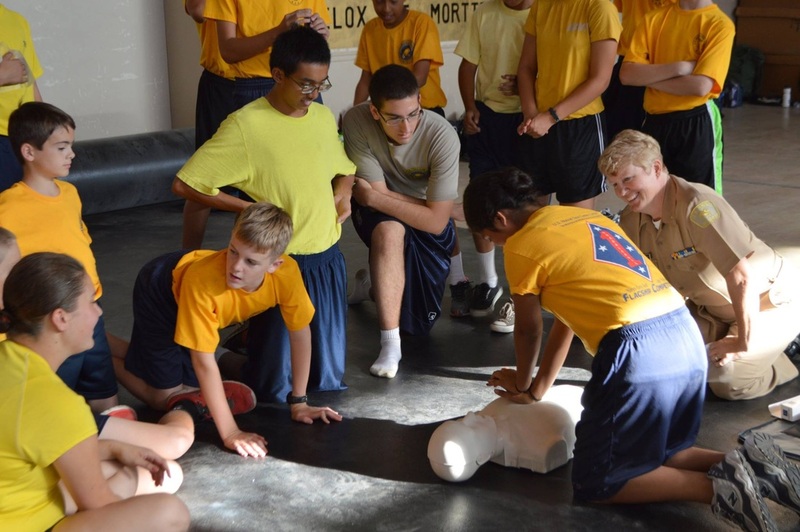 Cadets learned First Responder skills during regular drill. Each cadet came away feeling just a little more prepared should they ever need to utilize these skills during a real emergency. Escondido Battalion participated in the 5K Zombie Fun Run in Acton, CA. Cadets transformed into zombies and chased runners for the first three relays of the day. The tables were then turned as cadets negotiated a course of military-type obstacles, all the while avoiding zombies intent on stealing their flags. Our cadets and officers acquitted themselves proudly, with everyone completing the 5K event. The teamwork that they displayed in helping each other conquer the mud run obstacles is representative of how this battalion operates. 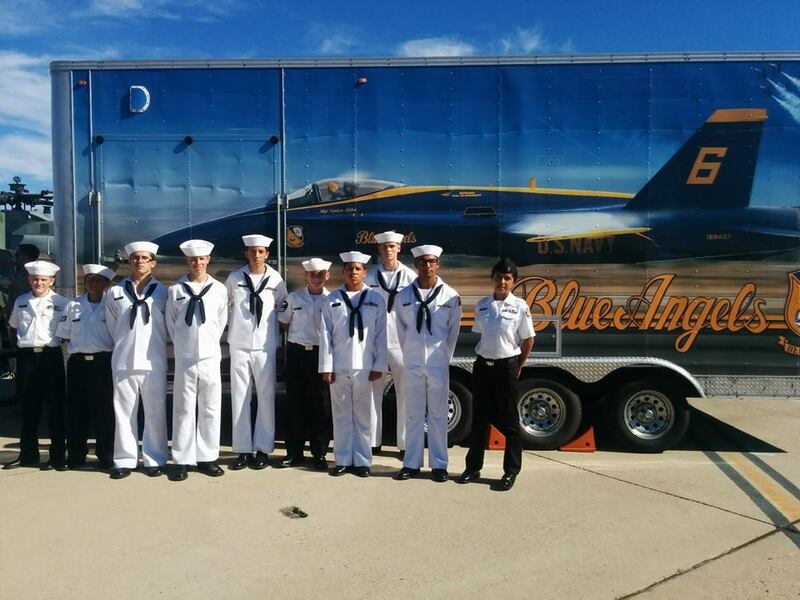 Cadets assisted the U.S. Navy Recruitment Contingent throughout the air show, berthing overnight at the Naval Operational Support Center. In between watch duties, cadets enjoyed watching the various air show events. The Blue Angels were amazing! Escondido Battalion practiced communication, group dynamics, confidence, decision-making, team spirit, trust, cooperation, motivation, creativity and conflict resolution on the UCR Ropes Challenge Course. Cadets were challenged to step outside of their comfort zone within an emotionally and physically safe environment. The first course involved physical and mental challenges conducted low to the ground and requiring group effort to accomplish.The next course took place on event poles 15 to 45 feet above the ground. Every cadet left with a feeling of accomplishment this day. Escondido Battalion cadets learned basic operational concepts of offensive and defensive military operations in a desert setting. Cadets practiced different forms of maneuver, radio and hand communications, infiltration/exfiltration techniques and much more, while simultaneously learning to manage personnel safety under hot and arid conditions. The cadets also effectively carried out a night reconnaissance mission with almost complete lack of moonlight. In addition to tactical operations, cadets were exposed to methods required for field berthing and chow. Escondido Battalion joined forces with Point Divide Division to undertake this challenging overnight bivouac. This drill was a favorite among cadets. STEM stands for Science, Technology, Engineering and Math and our unit spent a two day weekend learning these principles while building robotic Sea Perch units. 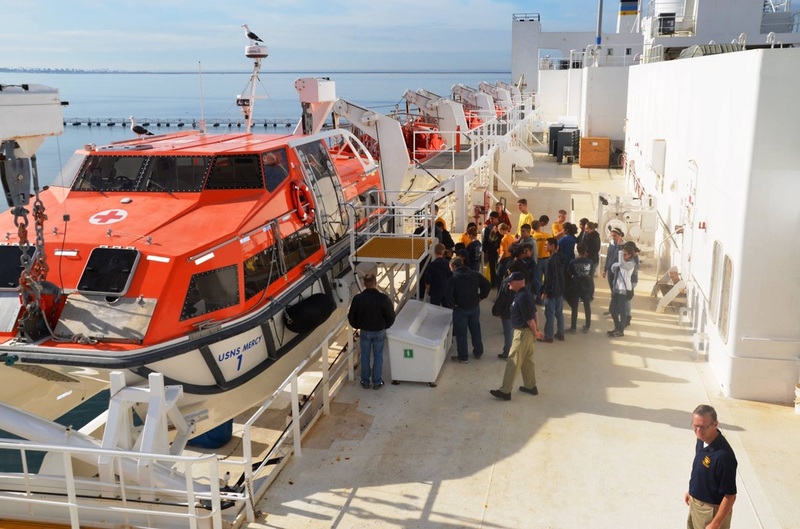 Under the guidance and instruction of LTjg Gene Anastasi, the cadets constructed their units from cutting and drilling the PVC frame, to soldering electrical wires to waterproof motors and propellers. At the end of the second day, the cadets tested their robots in water and were thrilled to see them quickly respond to their controller's commands. Seven teams competed at Los Osos regional competition in March. Four Escondido Battalion cadets qualified to go on to National Competition in the Midwest funded by the National Sea Cadet Organization. Escondido Battalion had a last minute request to perform Color Guard at the Spirit of '45 celebration near the Kissing Statue next to the USS Midway Museum. Donning our new color guard equipment our cadets performed a quick routine to open the ceremonies. The cadets even received some local media coverage when KGTV Channel 10 videotaped them at the start of a segment about the celebration. This was a great start for our new Color Guard unit! Look for us, in future, at events near you. Several of our cadets attended an optional drill at the Escondido Fish and Game association to qualify for the marksmanship ribbon. Thanks go out again to the good people at the EF&G who graciously host our unit and provide safety instructors.